Complications of prosthetic leg use in persons with lower extremity amputation often occur at the prosthetic socket, and includes delayed wound healing, recurrent skin ulcerations, and pressure damage to soft tissues. Such complications can result in limited mobility, which further contributes to conditions such as obesity, musculoskeletal pathologies, and cardiovascular disease. Conventional prosthetic socket fabrication is an artisanal process requiring substantial human hours, financial cost and patient involvement for evaluation. Computer aided design (CAD) and computer aided manufacturing (CAM) methods have been explored as an alternative. However, these tools have not reached full clinical efficacy and do not inform the design in a data-driven sense since the actual design process remains a manual and experience-based procedure. The long-term goal of our research is to develop a fully-quantitative process for prosthetic socket design and production that requires minimal patient involvement and can be delivered at affordable price points. A pre-print for our novel patient-specific and data-driven computational framework for the automated design of biomechanical interfaces is presented here. Optimization of the design of biomechanical interfaces is complex since it is affected by the interplay of the geometry and mechanical properties of both the tissue and the interface. The proposed framework is presented for the application of transtibial amputee prostheses where the interface is formed by a prosthetic liner and socket. Conventional socket design and manufacturing is largely artisan, non-standard, and insufficiently data-driven, leading to discrepancies between the quality of sockets produced by different prosthetists. Furthermore, current prosthetic liners are often not patient-specific. The proposed framework involves: A) non-invasive imaging to record patient geometry, B) indentation to assess tissue mechanical properties, C) data-driven and automated creation of patient-specific designs, D) patient-specific finite element analysis (FEA) and design evaluation, and finally E) computer aided manufacturing. Uniquely, the FEA procedure controls both the design and mechanical properties of the devices, and simulates, not only the loading during use, but also the pre-load induced by the donning of both the liner and the socket independently. Through FEA evaluation, detailed information on internal and external tissue loading, which are directly responsible for discomfort and injury, are available. Further, these provide quantitative evidence on the implications of design choices, e.g. : 1) alterations in the design can be used to locally enhance or reduce tissue loading, 2) compliant features can aid in relieving local surface pressure. 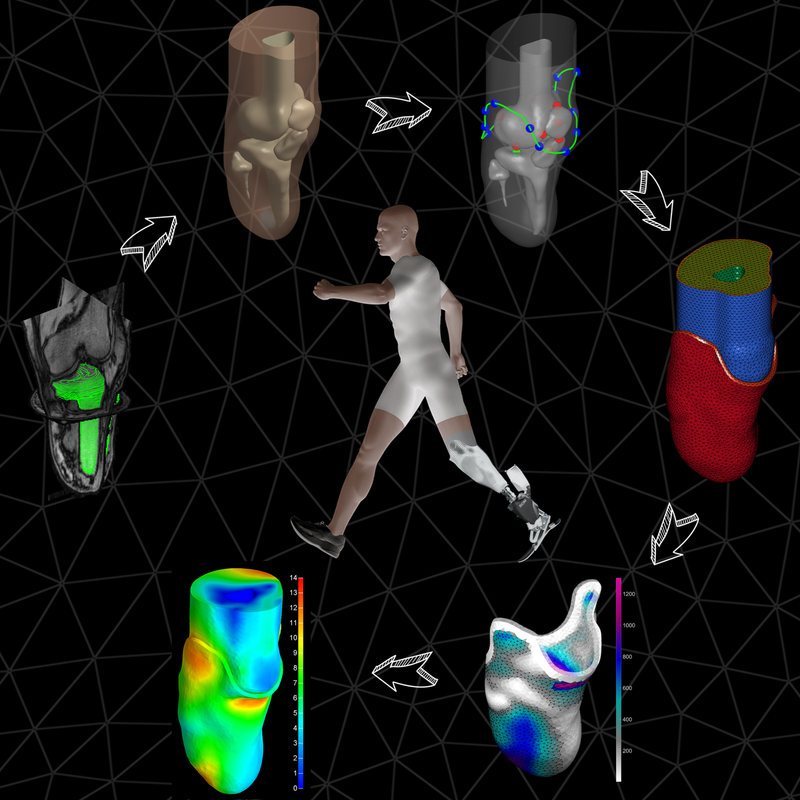 The proposed methods form a patient-specific, data-driven and repeatable design framework for biomechanical interfaces, and by enabling FEA-based optimization reduces the requirement for repeated patient involvement in the currently manual and iterative design process.